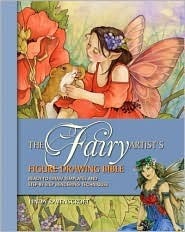 Attention faerie lovers, artists, and seekers of the ethereal and fantastical: this is the book for you! Bound like an ancient tome full of beautifully rustic pages and dazzling sample illustrations, this step-by-step drawing guide introduces us to the wonderful realm of faerie art. Fantastical worlds and characters — fleshed out with inspirational references to fae-related works such as Arthurian legends and folktales — come to life on the pages. Throughout the book’s chapters we are shown how to organise artistic ideas, develop reference scrapbooks, sketch down concepts, and create stunning illustrations easily and without fuss. The book is arranged neatly into six parts, each devoted to a particular aspect of faerie art. The first, second, and last sections are ones of suggestion and guidance. Ms. Ravenscroft introduces us to a variety of writers, poets, and artists whose breathtaking work is mystical and fae in nature, providing us with a concise and convenient gallery of sources from which to draw inspiration. She also demonstrates basic art techniques, such as how to choose and utilise artistic media, how to employ colour in drawings, and how to compose an effective sketch. Her instructions here are crisp and informative without being overbearing; and her sample sketches are easy to understand and a delight to look at. I tried my hand at watercolouring, following the steps she’d outlined in the text, and was very pleased with how fun and simple she’d made the process of mastering the brushes and paints. After the basics of art and historic lore are finished, the book gets even better. Now Ms. Ravenscroft takes us deeper into the world of drawing faeries, showing us first how to sketch their bodies in various poses of coy exuberance, delicate flight, and quaint observance; then she goes on to show us many samples of faerie garb that we could choose to use in our own drawings, along with common fae accessories. This part of the book is by far the most beautiful and enchanting. Here we see pages of gorgeous floral gowns for faerie queens and caps and buckled shoes for the lads, alongside a plethora of faerie wands, daggers, chalices, crystal balls, jewellery, and hats, all drawn with a muted brown pen and coloured in rich, rustic earth tones. Ms. Ravenscroft devotes the last half of the book to showing us how to sketch, draw, and paint specific kinds of faeries. She leaves not a stone unturned; not only does she demonstrate step-by-step how to create beautiful depictions of flower faeries, dryads, sylphs, and fae royalty, she also remembers to touch upon the darker side of the fae folk, showing us how to depict boogies, goblins, and naughty spriggans as well. This section of the book is extraordinarily lovely throughout; her drawings run deep with ancient charm and playful sophistication, conjuring portals to other eras and other lands. As with the other sections of her book, Ms. Ravenscroft also remembers to keep her instructions pleasant and simple to follow for those seeking to create faerie drawings of their own. For each type of faerie she plainly outlines the colours and media needed to work the sample drawing, and then follows this with detailed instructions on how to go about sketching the figure. She pays special attention to areas that might be trickier than others — such as the intricate shading of snowy hills — and offers ideas for variations of the sketch for artists who wish to add their personal touch to the work. All in all, this book is the epitome of excellence and a joy to read. Inspirational, beautiful, and encouraging, it combines the seductive grace of the fae folk with the plain practicality of a good teacher. Whether you wish to draw flower faeries, sketch spriggans, or just want to look at incredible artwork, this book is a must.